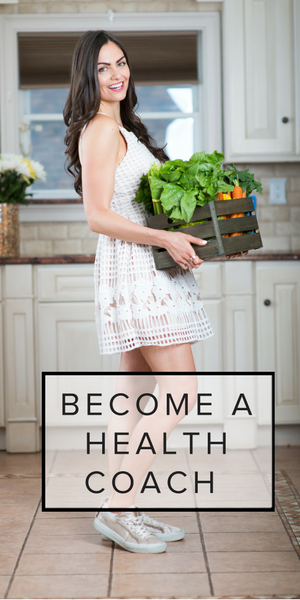 If you’re going to make the effort to eat your fruit and vegetables, make sure you’re preparing them in such a way as to unlock the maximum nutrients and health benefits. In researching cooking techniques for The Real Food Grocery Guide, I learned these seven fascinating tips that will help you get the most out of your produce. Garlic is well known to provide a plethora of health benefits, including a protective effect against cancer. Its anticarcinogenic effect is believed to be due to the compound allicin, which is created after 2 chemicals in the garlic mix after it is chopped, chewed, or crushed. To prevent this compound from being degraded in the heat of a hot pan, chop or crush it 10 minutes before cooking it. Research indicates that this time period not only allows the maximum amount of allicin to be created, but it also becomes somewhat protected from the heat, and maintains some of its cancer-protective properties. 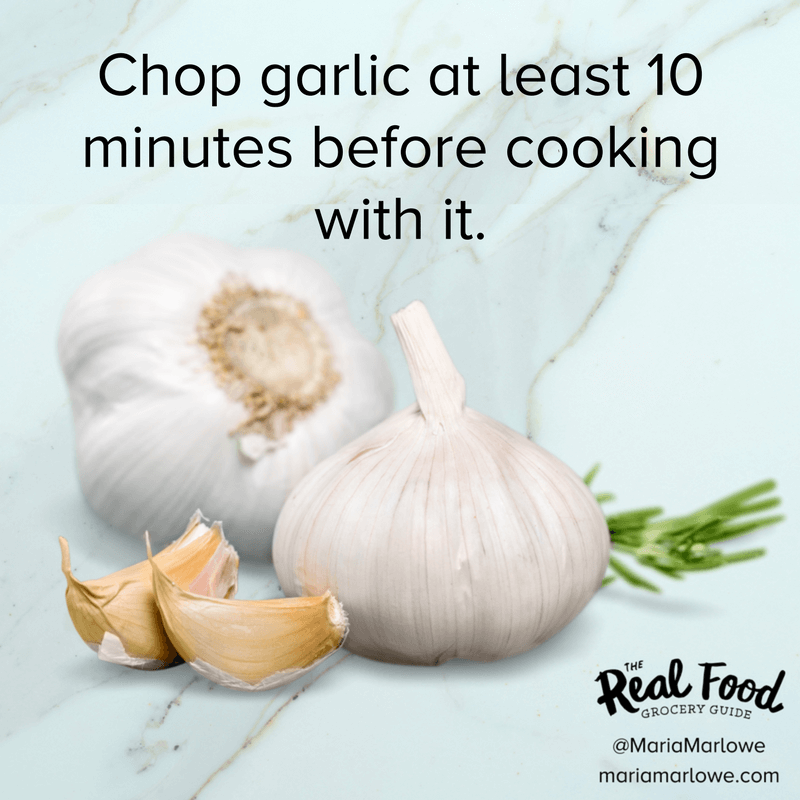 If you throw garlic into the pan before that, you’ll get the delicious flavor, but without the anticarcinogenic benefits! 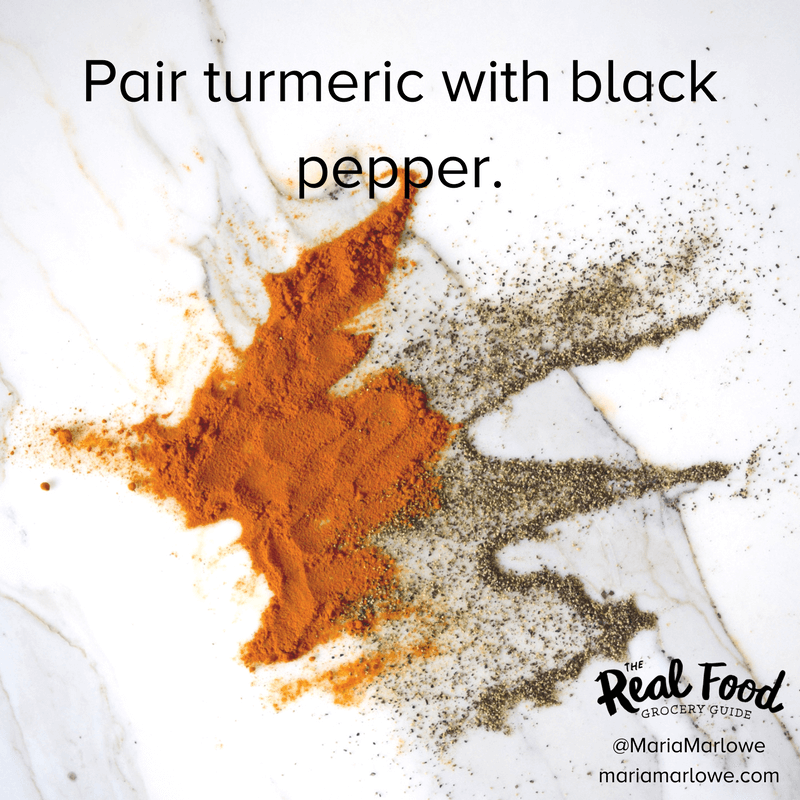 Turmeric is well known for it’s anti-inflammatory benefits, but to get the most out of the spice, always pair it with black pepper. A compound in black pepper, piperine, increases the bioavailability of the active compound in turmeric, called curcumin. In one human study, when subjects were given curcumin alone, they showed undetectable or very low levels of it in the blood, but when administered with piperine, the bioavailability of it increased 2,000%. 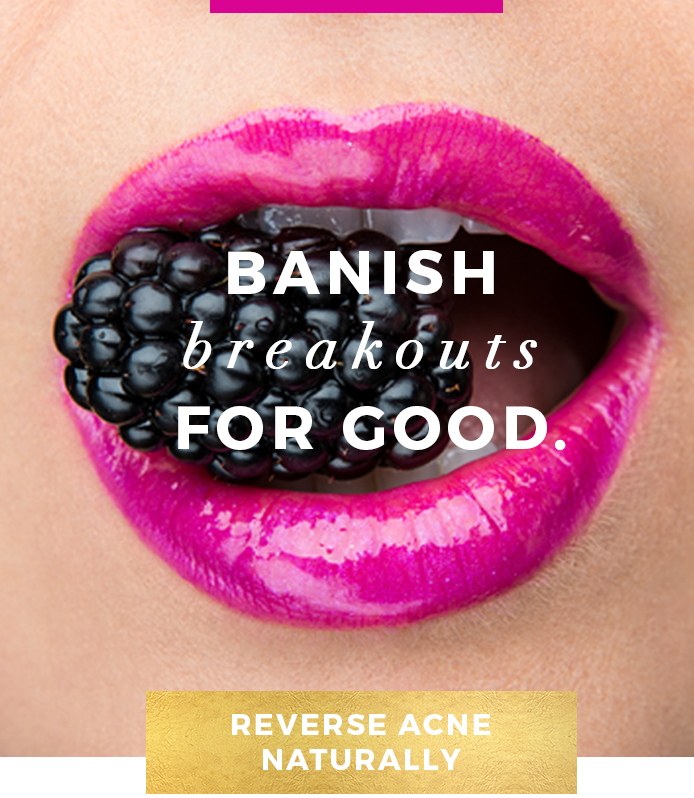 Even just a pinch of pepper – 1/20th of a teaspoon – can significantly boost levels. 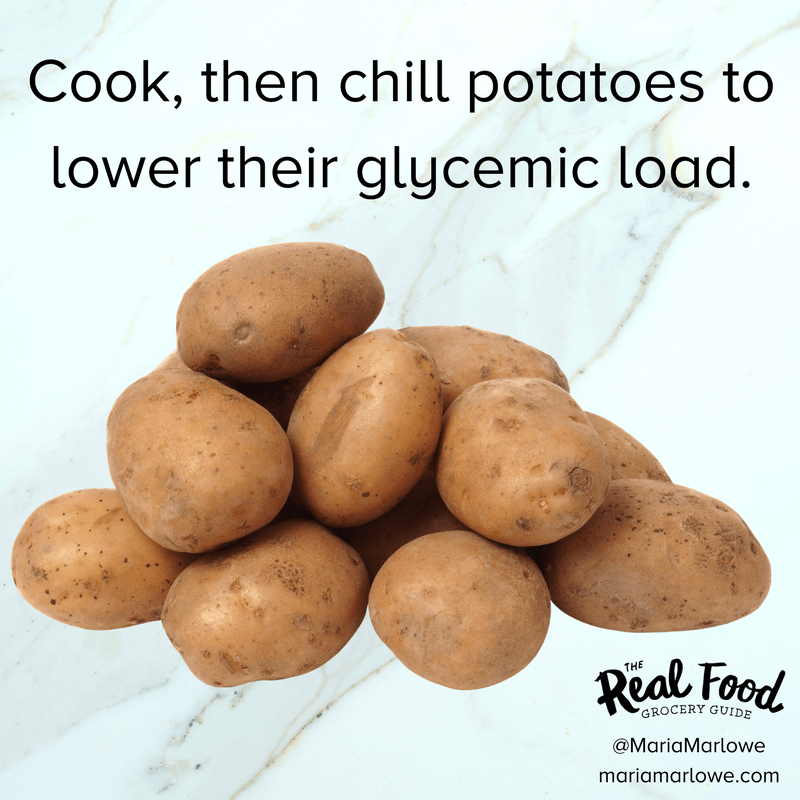 Consuming a low glycemic diet is one of the best things you can do for your health…and is precisely the reason potatoes often get a bad rap for “being too starchy.” It’s true that potatoes have a higher glycemic load than most other veggies, but you can minimize their effect on blood sugar by preparing them wisely. Cook them how you wish, then refrigerate 24 hours, and reheat if you desire. The cool temperature converts the rapidly digested starch into one that’s more resistant-meaning it is broken down more slowly and is gentler on the body. Research suggests this technique can reduce their impact on blood sugar by about 25%. 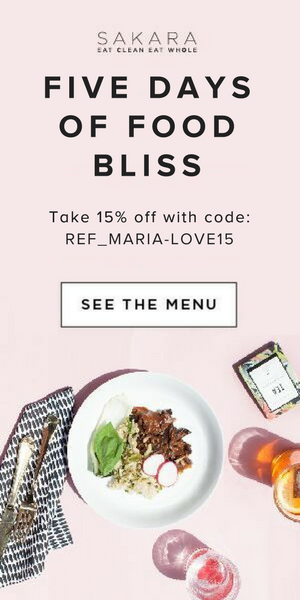 Topping with a vinegar dressing further reduced their impact on blood sugar. 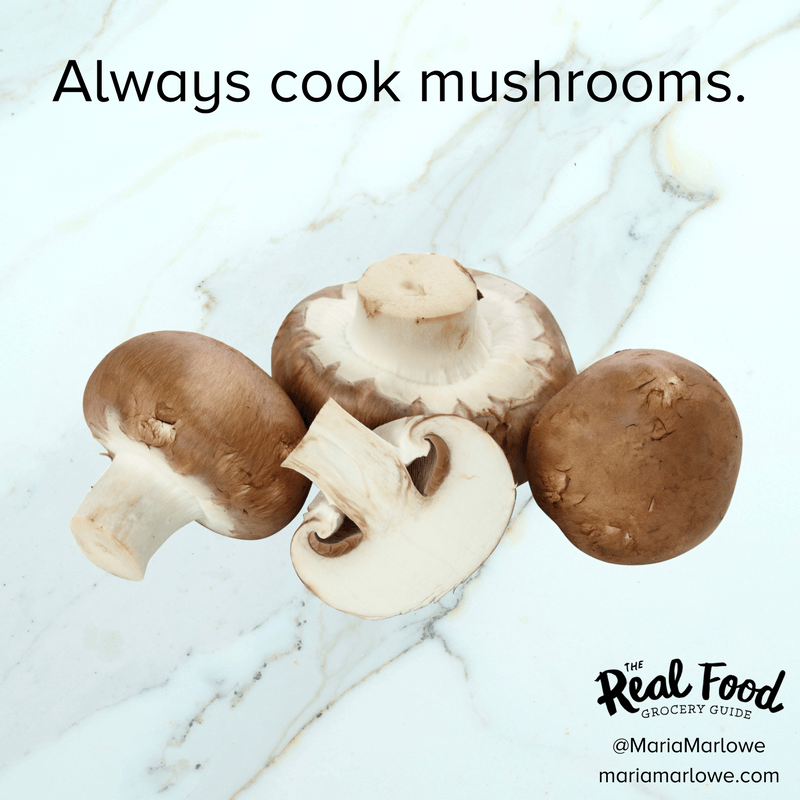 Mushrooms provide wonderful immune-boosting benefits, and are a great addition to a healthy diet…as long as they are cooked. Mushrooms contain compounds that interfere with the absorption of nutrients when consumed raw, but their effect is diminished or eliminated when cooked. 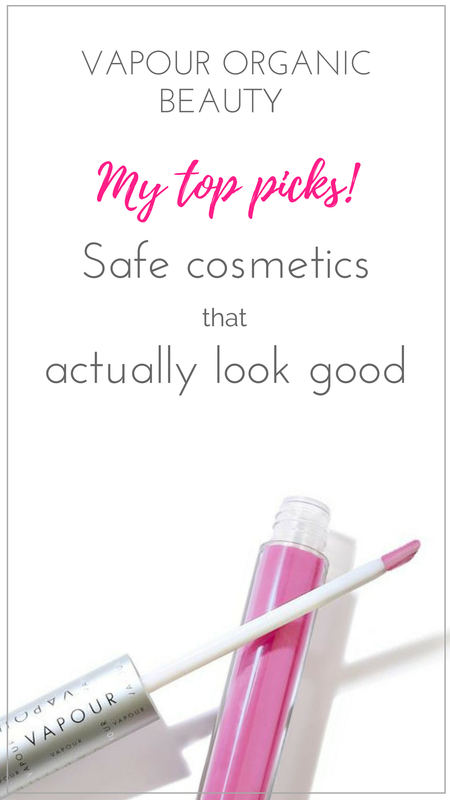 They also contain some toxins, some of which are considered carcinogens, which again, are destroyed in the heat. Try, broiling, grilling, or sautéing them. 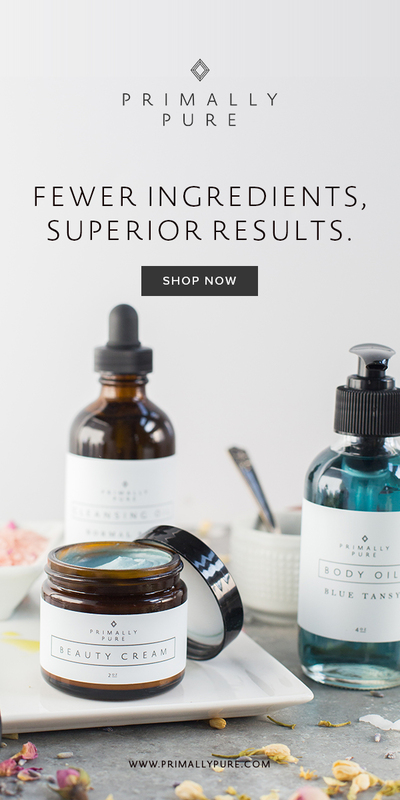 As with many fruits and vegetables, the most nutrient, antioxidant-rich part is often the skin, or the flesh directly underneath it. That holds true for avocados: The slightly darker green rim of flesh, which sits directly beneath its alligator-like outer skin is the most antioxidant dense. 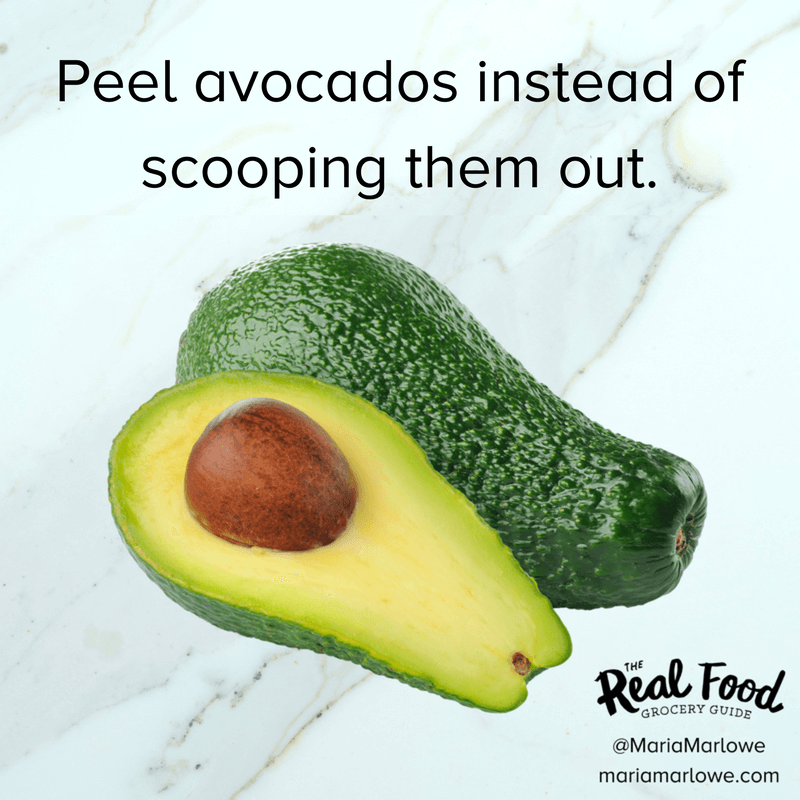 To ensure you don’t miss out on it, after slicing in half and pulling apart, starting at the stem, carefully peel away the skin (it’s easy), and then slice as desired. This will ensure you get all of the avocado flesh, which is sometimes missed with a spoon. Don’t throw away beet greens! Although we commonly eat beetroots, which are nutritious in their own right, the leafy green stems they are connected to are even more nutritious. 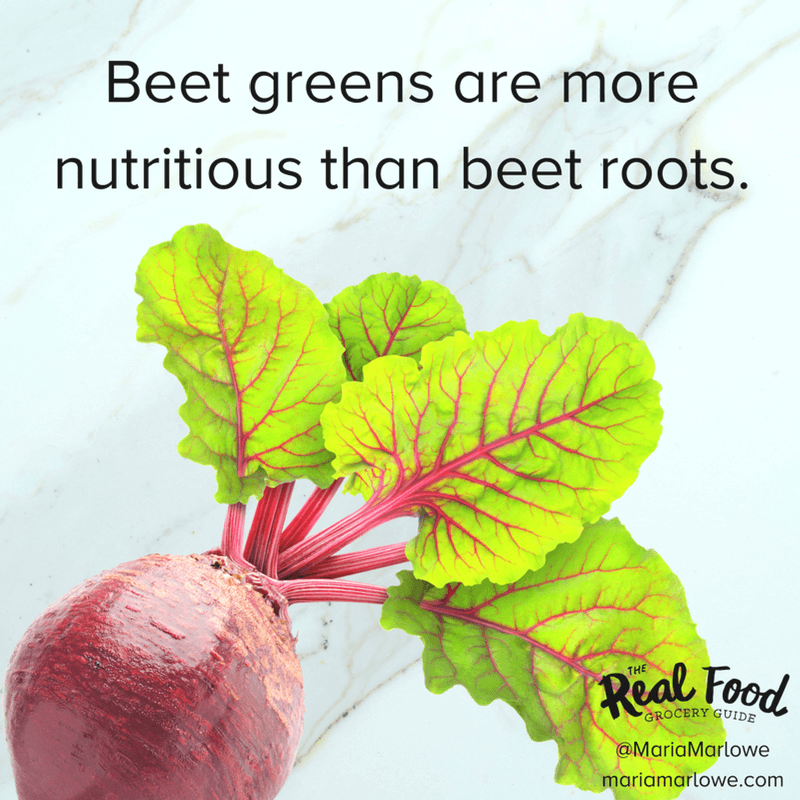 For example, they are an excellent source of Vitamins A,C, and K. So, next time you buy beets, instead of buying loose roots, opt for the bunches with the leafy greens still attached. Cut them off, leaving about an inch of stem on the beet roots, and use within a day or two of purchase. (While beetroots last a while, the greens go bad rather quickly). Chop up the leaves and the stems, and saute with garlic and olive oil, for a delicious side dish that tastes similar to spinach. 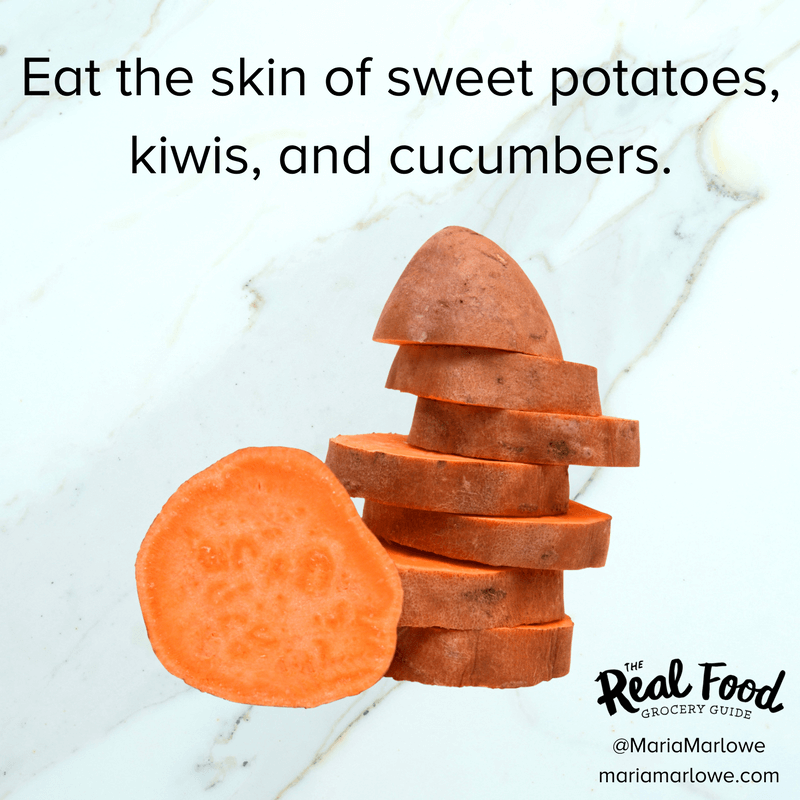 The skin of these fruits and veggies are not only edible, they are more anti-oxidant-rich than the flesh underneath! They also contain added fiber, too. For example, according to the California Kiwifruit Commission, a recent study indicates that eating the skin triples the fiber intake compared to merely eating the flesh. And by not peeling the skin, you preserve much of the vitamin C content as well. 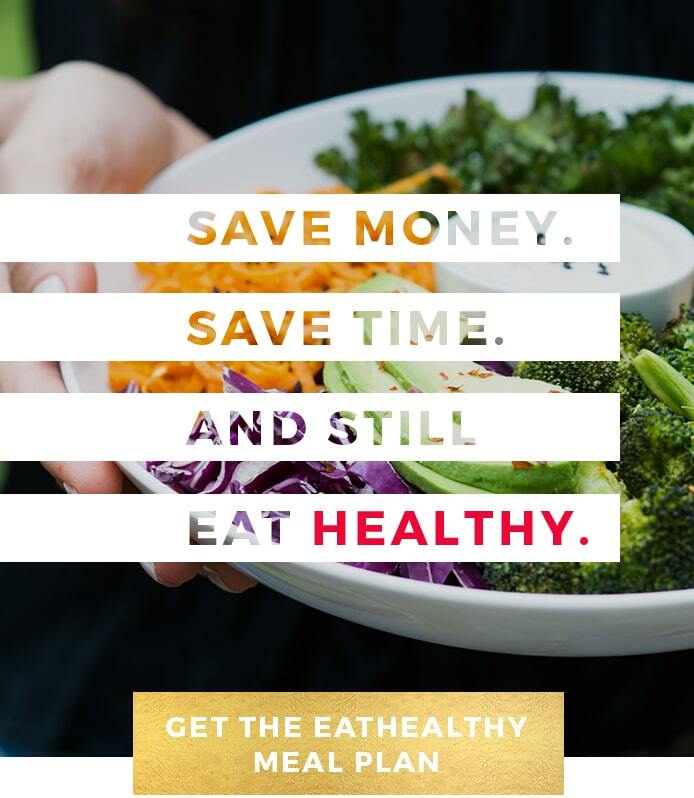 For more tips on unlocking the most nutrients from your vegetables, and to learn how to select the healthiest foods in every aisle of the grocery store, check out my book, The Real Food Grocery Guide.